Means of transport in Malta, providing suggestions of what to do in Malta. There are various car hire companies in Malta. You can book your car rental packages in Malta through internet booking or when you arrive at Malta International Airport. Be sure to source either a hard copy of a Map of Malta or online before your arrival in order to familiarize yourself and have a bit of an idea of what to expect prior to your arrival here. Malta car rental deals are preferably done before you come to Malta as this usually affords you a better deal where you can check prices and conditions of rental. Although the Maltese islands are small, transport in Malta is essential to fully explore the beauties of the Maltese people. Malta offers a very good bus service both for Malta and Gozo. The old Malta bus before the present operator was introduced still remains one of the tourist attraction. Unfortunately they have been removed from service and many do miss them for their old body style, paintings and decorations. Public transport is a very good alternative for those who do not wish to rent a car. The service is relatively cheap and covers all the important locations in Malta and Gozo, including historical locations, beaches, hotels, entertainment, restaurants, Gozo ferry service. If you do not wish to rent a car you can easily use the public transport and the hop-On hop-Off service offered by three local companies. It is an excellent service that offers different routes which include the main important aspects of all Maltese culture. Booking is through the hotel reception desk or the hop-On hop-Off company representatives. It is very easy to come across representatives in the main areas of the island where you will find them selling tickets. Main pick up areas can be St. Julian’s, Sliema and Gzira. There is no need for pre-booking. Various companies offer bus tours. These might be already included with your holiday package. You will find available booklets advertising tours which will enhance your holiday. They include local Maltese feasts, cultural tours, Malta by day and also one day tours to Gozo, and their historical locations. Today the horse driven cab is only used to take tourists on tours around Valletta and Mdina and another few choice localities. It is one of the oldest traditions. 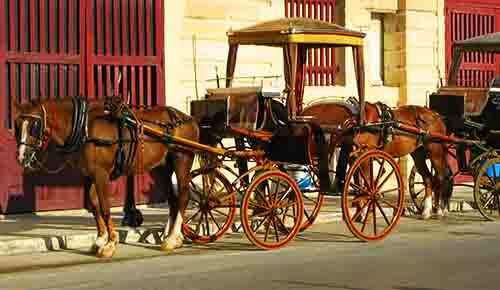 A pretty sight when you visit Mdina and see tourists being horse driven through the beautiful streets of Mdina. A truly picturesque sight. Take a photo and it will remain as a wonderful memory of Malta. Very similar to Malta. Same public transport buses are used to get around to see the main attractions, and get to the beaches. Taxis are also available from near the Gozo ferry although you would have come to Gozo either by rented car, an organized tour or with the public transport which are very efficient and provide a good service. The hop on hop off is another very good alternative for a small island like Gozo. Transport in Malta is your ideal way to explore our islands.